WARNING: Leave all work to trained and licensed electricians. Attempting repairs yourself is extremely dangerous, with the potential for serious injury and even death. Greg Smith Equipment assumes no responsibility or liability for individuals doing the work as shown. Make sure that the balancer is on its own dedicated breaker. 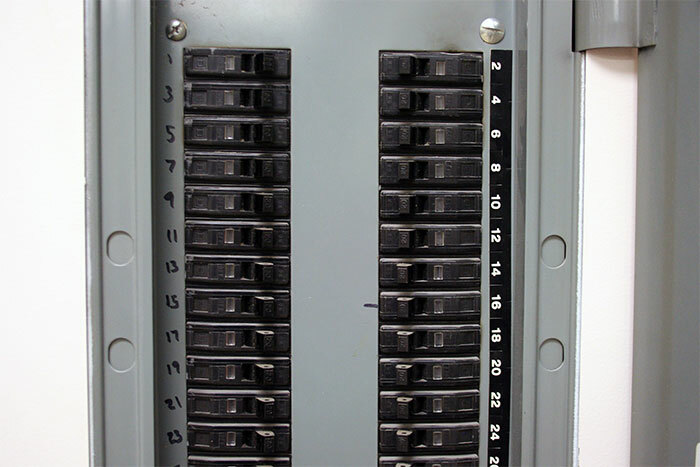 There should not be any other appliance sharing the same breaker as the balancer. This would include Fans, radios, or any other 110-120 volt appliance. To protect your investment, it is highly recommended that a quality surge protector/battery backup is purchased and installed. 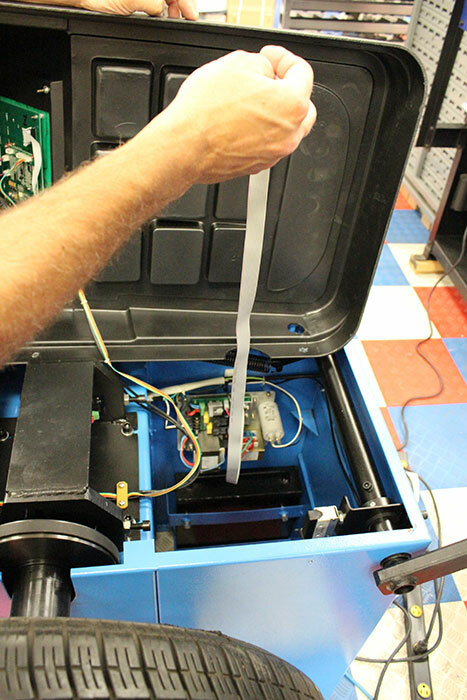 Atlas® balancers have a computer board in them. The computer board may fail if there is a lightning strike or an electrical power surge. 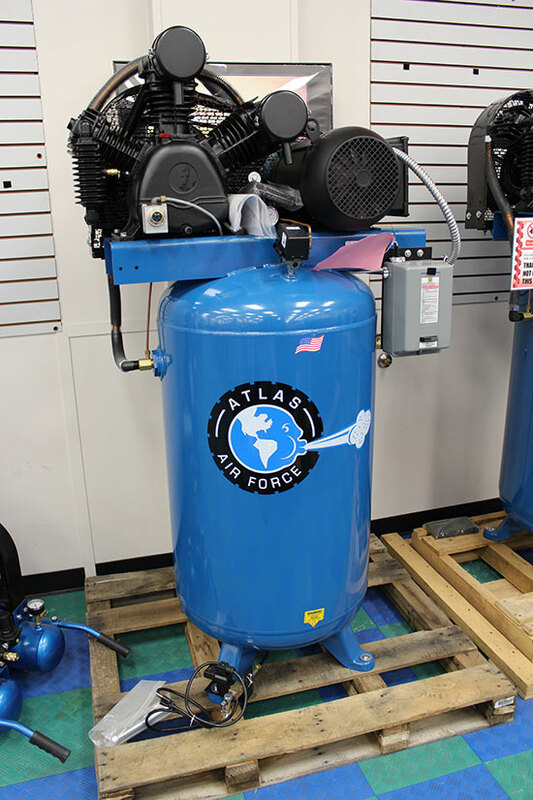 If equipment like an air compressor is near the balancer, relocate the balancer or the piece of the equipment that creates vibration through the floor. Atlas® balancers are very sensitive which makes them accurate which insures a quality balance every time. Vibration distorts the balancer and gives inaccurate readings. Remember, the only vibration the balancer should be receiving is from the tire and wheel assembly. Check the fuse or breaker in the electrical panel. If it is burnt or tripped replace the fuse or reset the breaker/or replace. 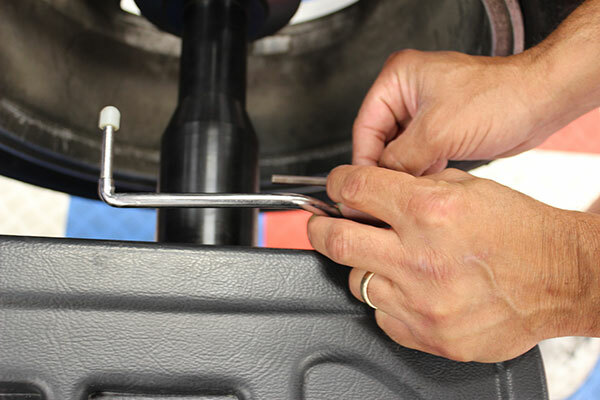 Remove the 4 bolts on the wheel balancer weight tray. Next, remove the distance gauge. With care, remove the wheel weight tray and set to the side. Be careful to not let the wheel weight tray fall because of the wiring harness that supplies power to the computer board. Check the voltage coming into the balancer to the ON/OFF switch. With the balancer plugged in, turn the power on to the balancer and check the voltage. 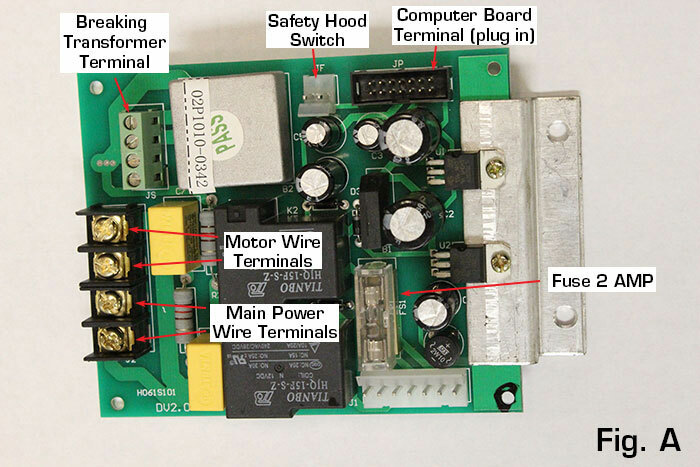 The power supply board distributes specified voltage to different components on the balancer. There are some terminals on the power supply board that will need to have the voltage checked. These terminals are labeled below. 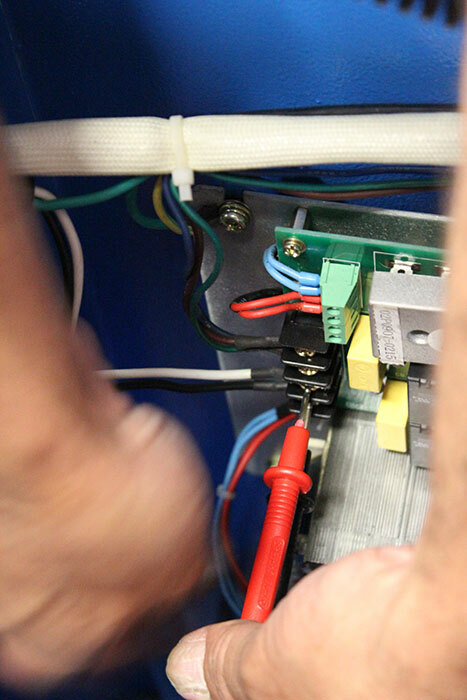 If the fuse is blown the balancer power supply board will not distribute voltage to the appropriate locations. There are 2 ways to check the fuse. 1) Visually inspect the fuse to see if the element is severed. 2) Use a multi meter (digital or analog) and set turn the knob to OHMS Ω. 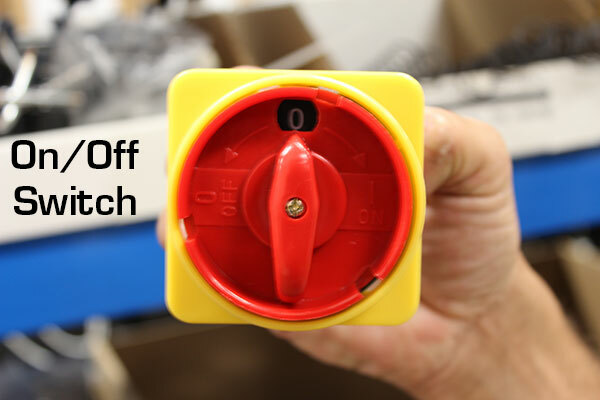 Touch each side of the fuse with the volt meter terminals. 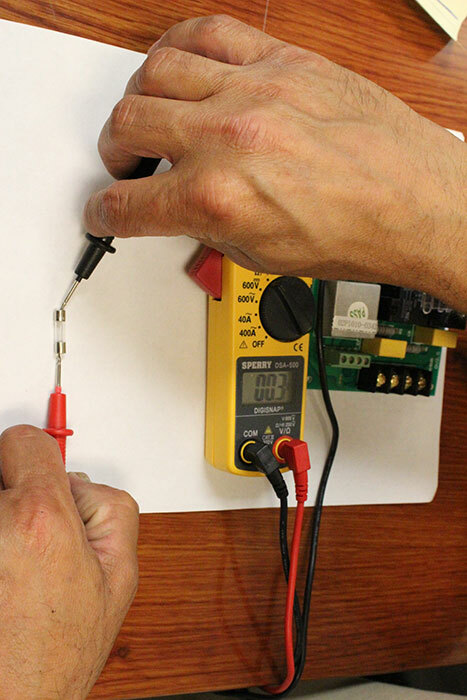 See links below on how to check for OHMS Ω. Refer to Fig. A above for main power wire terminal location. 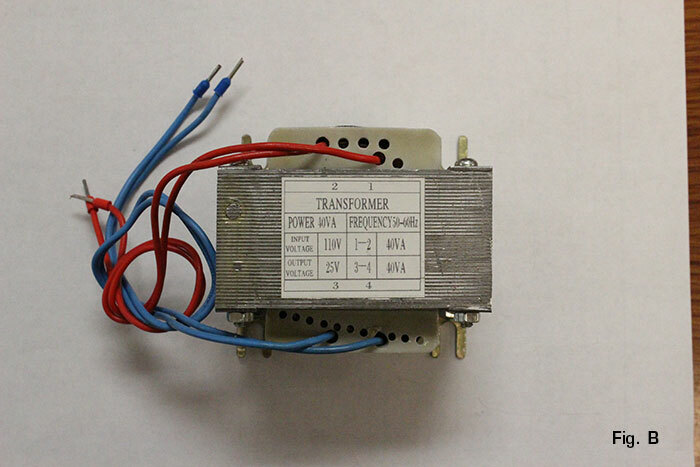 Transformer: A device for changing electrical energy: a device that transfers electrical energy from one alternating circuit to another with a change in voltage, current, phase, or impedance. Note: Make sure the balancer power is on while testing the transformer. 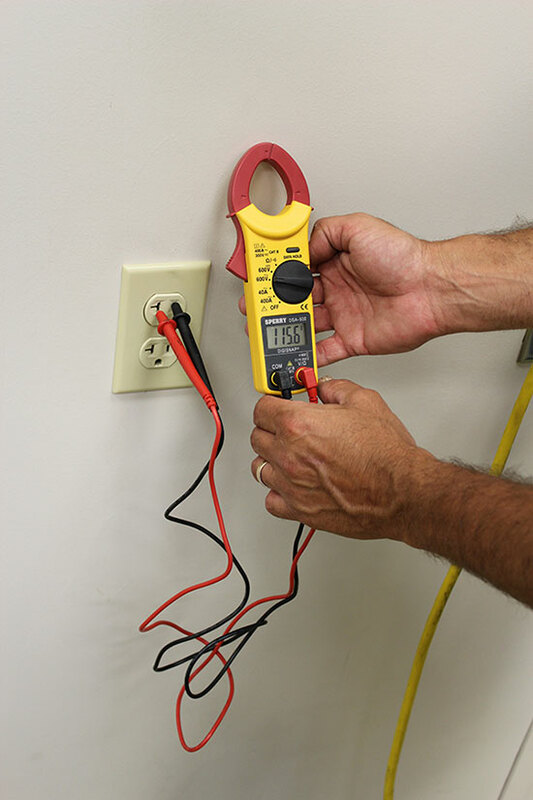 Use your multi meter to check the incoming voltage to the transformer. Place the red multi meter probe on 1 of the red wires. Place the black multi meter probe on the remaining red wire. 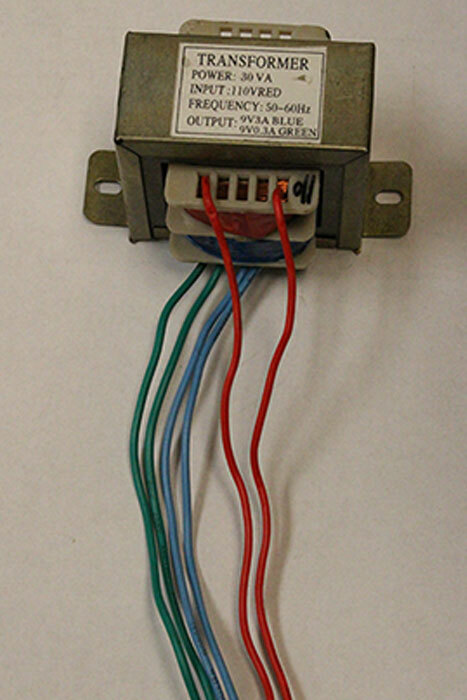 The red wires on the transformer should produce minimum a voltage of 110V. Follow the same steps with the multi meter for the blue and green wires. The blue and green wires should produce a minimum voltage of 9V. So there is no confusion, this is a “BRAKING TRANSFORMER” in Fig. B.
Braking Transformer: The braking transformer is used to reduce the speed of the electrical motor. This device will not be voltage tested in this electrical flow chart. 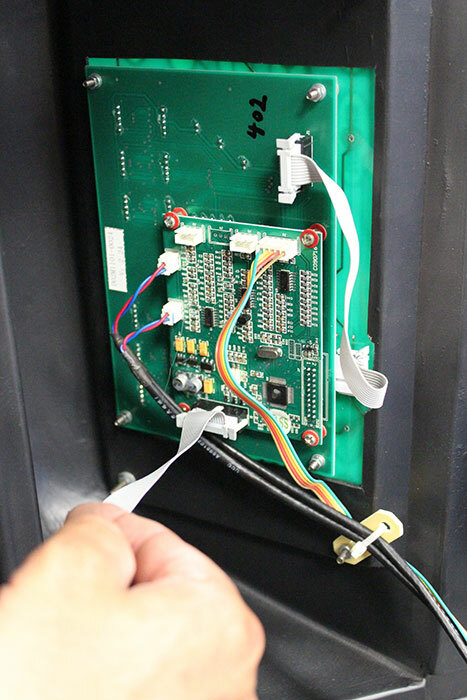 The ribbon cable is located on the power supply board and runs to the main computer board on the back of the LED display screen. 1) Turn the power off to the balancer. 2) Disconnect the ribbon cable from the power supply board and the main computer board. 3) Inspect the ribbon cable carefully. Look for tears in the ribbon; faulty connections. 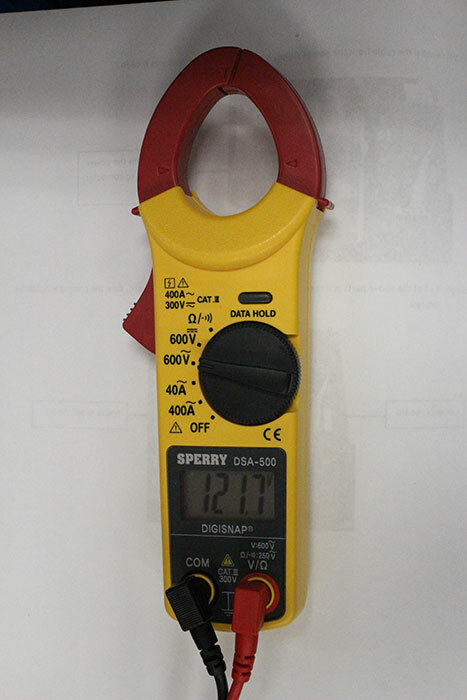 The purpose of this test (OHMS Ω) is to check for a short in 1 of the wire strands on the ribbon cable. This will take a little time and patience because each wire strand needs to be tested.Â See below. 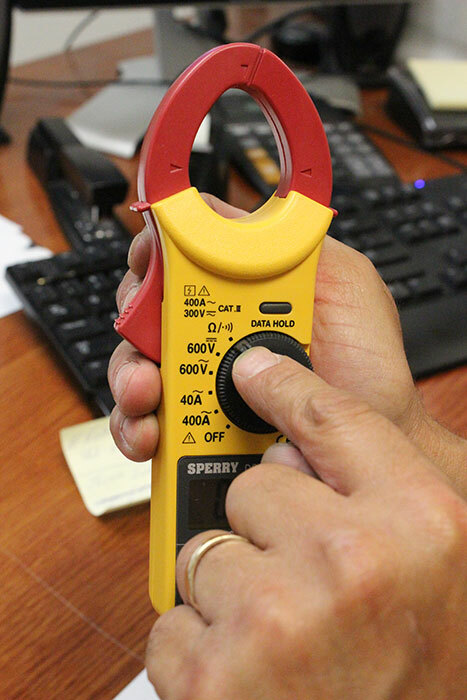 The purpose of this test (OHMS) is to check for a short in 1 of the wire strands on the ribbon cable. This will take a little time and patience because each wire needs to be tested. Follow steps above. 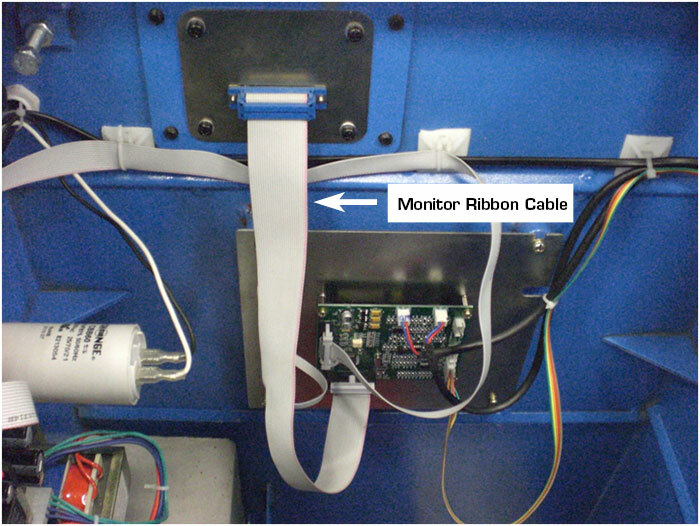 Follow the same procedure for the monitor ribbon cable. 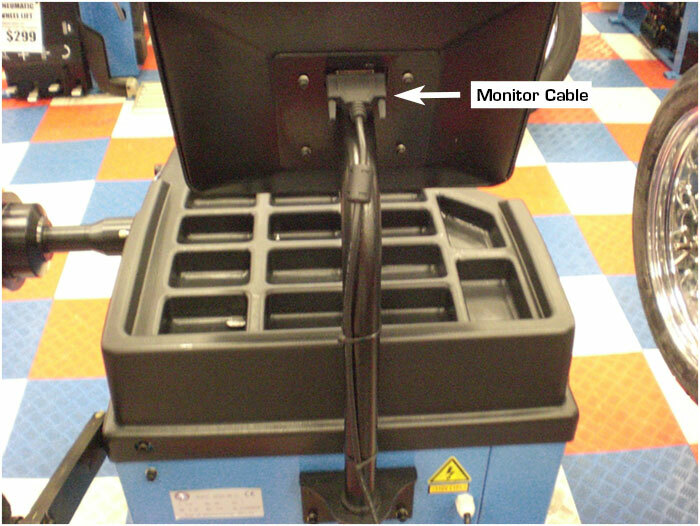 Make sure that the monitor cable is making full contact from the back of the balancer to the back of the monitor. If the monitor cable is not properly connected, the monitor will not light up. This is often confused as a power issue.